Discover the top visitor spots in Boston and Cambridge on this fully narrated tour! Enjoy 5 hours of guided fun as you discover the area's best neighborhoods by comfortable motorcoach. 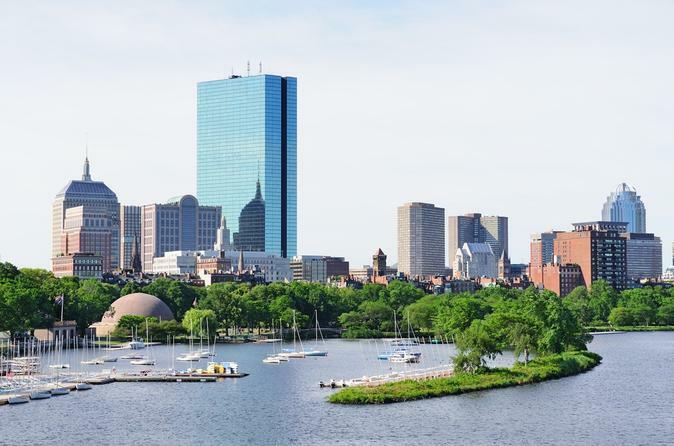 Start in Boston and continue into Cambridge to visit Harvard Yard, then loop back into Boston to explore Fenway Park, Copley Square, Beacon Hill, the North End and waterfront, and the Charlestown Navy Yard. You'll have opportunities for photos and even a cup of chowder! Depart from Park Square in Downtown Boston at 9:30am and travel across the Charles River to Cambridge. Cruise past the renowned Massachusetts Institute of Technology and into Harvard Yard, home of Harvard University. Take one hour to yourself to explore Harvard Yard, Harvard Square, the charming shops lining the streets, and the area once home to JFK, Bill Gates, Matt Damon, Mark Zuckerberg, and more! Continue through Cambridge and back into Boston for a photo stop at iconic Fenway Park- America's most beloved ballpark. Catch a glimpse of the Green Monster before heading to Copley Square, an architecturally delightful public square in Boston's upscale Back Bay neighborhood. Your route then takes you past stately and charming Beacon Hill, home to cobblestone streets, brownstone residences, and the Massachusetts State House. Meander toward Boston's scenic waterfront area and pause for a complimentary cup of classic New England clam chowder from one of Boston’s well-known restaurants. After exploring this area of the city, known as Boston's North End, you'll spend 20 minutes across the water in the historic Charlestown Navy Yard. At the conclusion of your tour, you may choose to be dropped off at Faneuil Hall Marketplace or back at the starting location.